JOHOR BARU: Businessman Datuk Lim Kang Hoo, who recently made a privatisation bid for developer Tebrau Teguh Bhd, is planning a more than RM13 billion project at Danga Bay here. The soon-to-be-launched project is billed as the most exclusive and unique waterfront development in Iskandar Malaysia southern economic corridor over the next five years. It will spread over 120 hectares at the estuaries of three rivers at the Danga Bay. The Danga Bay waterfront development is an important component in one of the flagship developments in Iskandar Malaysia. 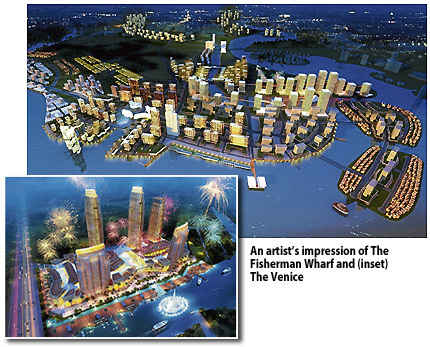 The site of the mega development is at two small peninsulas opposite the Danga Bay. The peninsulas are almost parallel to Sungai Sku-dai, Sungai Danga and Sungai Melayu. Five commercial epicentres have been planned for the riverine development combining the best of the east and west cultural heritage which is set to become the jewel in the economic region. The total project cost for the five epicentres, named The Venice, The Gateway, The Rivera, The Bund and The Fisherman Wharf, are estimated at RM13.4 billion. The 120ha project is part of the 800ha earmarked for the Danga Bay waterfront development. The development will be handled by Iskandar Waterfront Holdings Sdn Bhd (IWH). Lim, who is IWH chief executive officer, said the projects are conceived to inject life into the integrated waterfront development, aiming to attract both tourists and investors. "We welcome investors to take part in the development, either through joint venture with us, or on their own but based on our masterplan. "Our products will be totally different from what you would find in Singapore, as our purpose is not to compete with them, but to complement them by offering something which are truly unique so as to attract their interest," Lim told the Business Times at his office here recently. From what the names suggest, one does not need to travel far to Venice and Shanghai Bund to see the tourist destinations as both will be as near as the doorstep in future. The Venice is one of the most interesting features in the waterfront developments as it will simulate the real topography and architectural design of the Italian city, which are canals running across rows of Venetian-style buildings. Among the features in The Venice, which will be turned into a sleepless city, are a riverside promenade, a lifestyle street mall with a waterfront alfresco and entertainment outlets, a lifestyle street mall, hotels, apartments, among others. The Venice will incorporate several watergates to control water level and quality. Meanwhile, The Bund will showcase a lifestyle cultural village with water alfresco and entertainment outlets, apartments, hotels, among others. The Fisherman Wharf is the most expensive project, costing RM3.9 billion and is aimed at complementing the existing tourism products available at the Johor Straits, which are kelongs (offshore fish cages). Phase one of the project will see the development of apartments and sky villa while phase two will have a maritime museum, a riverfront boardwalk and wharf, and a fish auction plaza, together with hotels and thematic retail shops. The development will simulate the setting of the fishermen wharfs in Cape Town, Norway and San Francisco, but in a modern architectural setting to reflect the localised culture. Both The Gateway and the Rivera will have apartments, retail shoplots and hotels at the waterfront. SERI Chenang Resort & Spa Langkawi will be the newest addition to the Island of Legends when it opens this Labour Day and if forward bookings are anything to go by, this luxury boutique hotel has proven to be quite popular. It has managed to secure full occupancy for the months of May, June and July 2012. This 13-room hotel will be operated by brother and sister team Mohammad Shukor and Norlin Zainal Abidin. 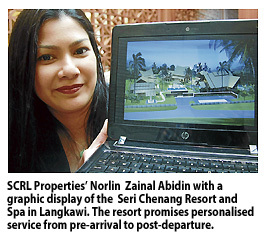 The resort is being developed by SCRL Properties Sdn Bhd on the land belonging to the duo's father Datuk Zainal Abidin. In 2009, Norlin then aged 35 and her brother 28 took on the challenge to develop and manage the hotel, instead of leaving the land undeveloped. Norlin, who has only a shopping complex management experience, had then decided to be a hotelier. Located on a 0.53ha of land on Kuala Chenang River next to the popular Chenang Beach, the investment into the hotel and land is to the tune of RM5 million. Seri Chenang will comprise of six villas, each designed like traditional Malay houses from different states including Negeri Sembilan, Terengganu, Kedah, Pahang, Malacca and Selangor. The smallest villa, a one-bedroom unit, measures about 113 sq m for a studio villa and the largest, a five bedroom unit, measures 393 sq m.
"It's set in a traditional style but equipped with modern amenities," she said. The resort is for anyone who appreciates tradition in today's modern luxury living. It will be marketed in Europe, Australia, Japan and Korea. The resort's focus will be on personalised service from pre-arrival to post-departure. "The general manager will greet each guest at the airport," she said. Despite an encouraging response in the first three months of operations, Norlin prefers to be cautious about performance in the first year of operations. "In the first year, we expect to achieve over 50 per cent occupancy and average room rate of RM1,700. In the second year, we are looking at an average occupancy of 70 per cent and an ARR of RM1,900," she said. The hotel is expected to run at a gross operating profit (GOP) of 50 per cent. The GOP is the cost of doing business or gross revenue (from rooms, food and beverage, laundry or business centre) minus cost of operations (wages, electricity and amenities). Accordingly, Norlin expects return on investment could take between five and seven years. In keeping with the Seri Chenang theme, the resort will have a spa, Kayangan Spa, which provides traditional treatments. While the hotel does not have a beach front, it is a mere five minutes away and there is free shuttle service to and from the beach. New concept: Shoppers walking past some stores at the Johor Premium Outlets. JOHOR BARU: The opening of the Johor Premium Outlets (JPO) late last year has created much interest among many Malaysian shoppers who are still new to the shopping concept. Southern region representative of the Malaysian Association for Shopping and High Rise Complex Management Jenny Chan said since it was a new shopping format, it would take time for shoppers to adapt and adopt. She said the luxury premium brand outlet format might not be new for Malaysians who had visited similar outlets overseas, but not for those who had never patronised such outlets before. “JPO is targeting at a specific group of shoppers hunting for reasonably priced quality and branded items,'' Chan said in an interview with StarBiz. JPO is the only such outlet in South-East Asia, while 58 other outlets are in the United States, one in Puerto Rico, one in Mexico, eight in Japan and two in South Korea. Among the brands avaialable at JPO are Armani, Burberry, Canali, Coach, Ermenegildo Zegna, Guess, Michael Kors, Ralph Lauren and Salvatore Ferragamo. The outlet is a 50:50 joint venture between Genting Bhd's subsidiary Genting Plantations Bhd and Premium Outlets, the retail outlet division of Simon Property Group Inc. Under the second phase of its development, Genting plans to spend RM100mil to increase the number of stores from the present 70 to 130. The company is also expected to invest up to RM1bil to develop the area, including constructing a 2,000-room hotel together with a water-theme park and a meeting, incentive, conference and exhibition centre. Chan said unlike in the Klang Valley and Singapore where customers were spoilt for choices when it came to branded fashion items available from shopping complexes, it was not the case in Johor Baru. She said for many years, Johoreans living in the city would either travel to Kuala Lumpur or cross over to Singapore if they were looking for branded fashion items. She said the opening of JPO saw many brands making their debut in the Johor Baru retail sector and offered to Johoreans a wider range of brands. 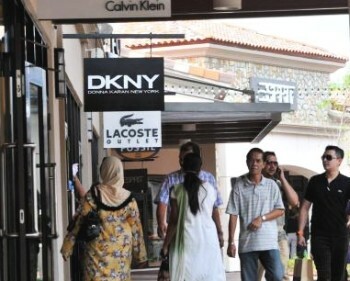 Chan added the format would work well with tourists and Malaysians from other states as well Singaporeans coming to shop at the outlet as it offered attractive bargains and discounts. She said shoppers would be pampered with original discounted goods with good quality and she hoped that consumers would support genuine luxury products instead of imitation goods. Asked whether the location of JPO was too remote, Chan said it was typical for Premium Outlets worldwide to operate away from the city centre. Chan said Johor's close proximity with Singapore would allow the outlet to tap tourists including those from Australasia, China, India, Europe and Middle East visiting the republic. Similarly Chan said JPO's presence would not affect other shopping mall business as its product range was totally different from normal shopping malls. She added that shopping mall tenant mix was based on the target audience needs, especially within 5km radius or up to 10km radius.